After almost 8 months of uninterrupted "up-up and away" movement in the markets the inevitable counter movement has arrived. Chinese markets which led the way up "mini-crashed" by almost 10% in a single day (Feb 27, 2007) anything having to do with scary themes such as: "South East Asia" (Singapore, Malaysia), or "real estate" (including commercial REIT ETFs such as VNQ) or "financials" (even those with no almost no exposure to the sub-prime markets) followed sharply down. No part of the world was spared. It was a classic picture of a somewhat unreasonably widespread panic. A period of straight 8 months of upward move is very unusual. That the correction was pretty violent, shouldn't surprise anyone who has been watching the behavior of the markets for some time. Big movements in either direction, tend to be followed by counter movements. As you can see in the above chart, defensive ETFs like Utilities and Telecom are now dominating the right (strongest momentum) section This is a sign of great fear, which is actually bullish. The pundits and talking heads have been arguing on CNBC and elsewhere on whether this is the start of a new trend or just a temporary setback. The overheating of the chinese markets, markets were up over 100% last year there. Valuations are too high. The speculative bubble there is obvious. I actually agree on this. I avoid the Chinese ETFs. The subprime lending market is starting to show significant stress Many recent US homeowners assumed too much risk, took mortgages above their means. As their mortage rates adjust they can't pay. Oil prices are again way up from their lows. Just like in May 2006. Stocks are still historically cheap. As cheap as they were in 1996-1997 before the big internet bubble started pulling the markets sharply up. Investors still haven't gotten over the last bear market, a lot of money is still on the sidelines; not committed to the market. The earnings-yield (inverted PE including accounting for dividends) on the S&P500 is way above the yield on the long term bond. Is there anything we can do to try and predict our odds? Where are the markets going? What are the best ETFs to be invested in going forward? I'm not sure whether to buy the housing boom argument (may be true in the Bay Area, where Google, Apple, and other booming companies keep hiring but not nationally), but I definitely agree with Ken's general bull case. I've seen a few bear markets, they never start with such bang and with so much scary talk as we experienced in the past few days. They also don't start when valuations and prospects are reasonable. Also, the up day following the biggest drop tells me there are enough buyers stepping in to take advantage of the opportunity. I'm betting on a short lived correction. As we learned in the last May-June 2006 correction, this might well be an opportunity to buy what we wanted to buy anyway, just cheaper. To get more specific answers we turn to the raw data. The first question is, assuming this correction is short lived, where are the markets going in the next few months? What this says is that starting from May 30, 2006 (not the bottom but well into the correction), ETFs on average went up sharply. How sharply? The rebound following the bulk of the last summer correction was: future 1-month average ETF return from that point onward was 1.58% and the future 3-month average ETF return was 4.37%. But with the tools and the data we have, we can do better. Which ETFs went up the most following the May-June 2006 correction? Let's look at valuations. Specifically: P/E ratios. We can see that there was a negative correlation between the future returns of ETFs and their average PEs. In other words: high-PE stocks faired worse than low PE (value) stocks. Things might always be different, but the similarities between the two corrections are just too big to ignore and I expect this to repeat. To confirm I look for days where markets go up following a big drop to see which ETFs are doing better in the early stages of returning to normalcy. The best performing so far are the usual suspects. To keep this correction in perspective you may want to peek at a recent article by Birinyi associates showing all 5% or more declines in the present bull-run. There were 6 of them in 4.5 years, or about 1.33 corrections/year. What is remarkable is how regular they look: they are spaced pretty evenly 6-12 months apart. The conclusion from all this is stay the course, don't panic. If you have the guts, now may be the best time to put some more money in solid value ETFs from around the world. This includes ETFs like the Wisdom Tree international ETFs (DIM, DOO, DLS, DFE), The Vanguard low cost Mid-Cap Value (VOE) and General Value (VTV). The Rydex deep value ETFs (RFV, RZV), the countries that still have reasonable valuations, (Germany: EWG, Belgium: EWK, Korea: EWY) or the broader European ETFs (EFV, VGK). [note: dated material. 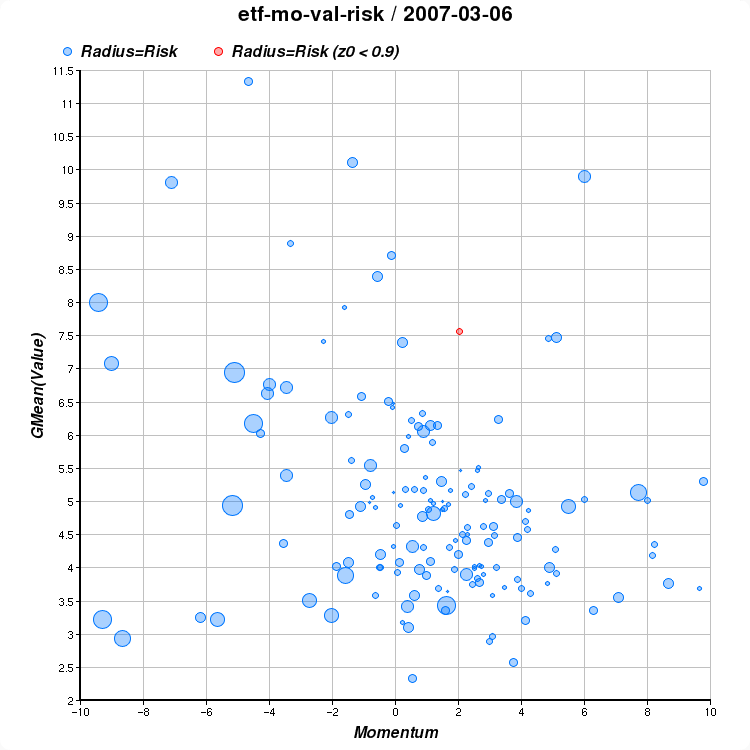 March 6, 2007] Momentum, Value, Risk: 50 out of about 290 ETFs, best to good order.